What is the Best Friend Dog Fence? Best Friend Dog Fence has quickly become the product of choice for the discriminating dog owner that would prefer a more humane alternative to an electric dog fence. Our dog fence is the cost-effective alternative to conventional wooden, electric, or chain link dog fence. Best Friend Fence is a secure dog fence that will safely and comfortably keep your dog within any designated area. 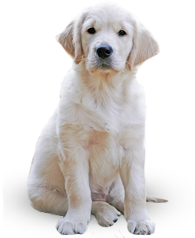 Our material can easily be installed, and will make for a visually unobtrusive dog fence that is difficult to see from as close as 15 – 20 feet away in most settings. 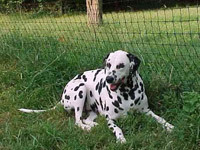 Our non- electric dog fence is constructed of high-strength and UV light resistant polypropylene plastic (black–the least visible color outdoors). Best Friend Fence is extremely easy to set up, and will last for many years. The material is shipped in easy to handle rolls that are available in varying heights and lengths with our dog fence. A wide range of labor saving accessories, including support posts, access gates, and ground stakes, make installation of our dog fence a breeze. Our aesthetically pleasing dog fences were originally designed to keep deer out, but over the past seven years the fencing has become an increasingly desirable non– electric dog fence alternative. Best Friend Fence dog fences is easily installed by unrolling the fencing and attaching it to existing trees (up to 15' – 20' apart) and, or to posts along the perimeter of the area you wish to enclose. Many of our customers end up surrounding their entire properties or large areas thereof, while others just create a smaller backyard enclosure, or dog kennel fence. If you choose to use our 7.5' high fencing, you will also be keeping out deer, thus eliminating damage to garden areas, and reducing the risk of contracting Lyme Disease on your property. Simple, yet detailed fencing installation instructions for our dog fences are also included with every order. For dog fences, kennels, or dog runs we offer various heights of materials ranging from 4' up to 7.5' high. We also offer 1.25" wide steel "U" posts (coated black with pre-drilled holes for attaching the fencing to – zip ties included) that are available in a variety of heights. Ground stakes that keep dogs from pushing under the fencing, are also available. If your dog is a chewer, then you may want to attach some of our vinyl coated wire mesh along the bottom of the fencing. Our company also offers several all-inclusive kits that can be easily utilized as dog fences. If you are looking for pet fences that you can easily install yourself, are completely safe for your animal, and are very cost-effective, then look no further than Best Friend Fence! Best Friend Fence is a visually unobtrusive dog fence system. Unlike an electronic dog fence, Best Friend Fence makes no use of electricity or shocking animals to keep your pets within a designated area. Electronic, or radio dog fence uses a wire buried around your yard to emit a radio frequency of a limited range. To use a radio dog fence, your dog is required to wear a special shock-emitting collar and must undergo training to learn not to approach the "radio broadcast area". An electronic dog fence is not a physical barrier. If the batteries in the collar run low, or your dog chooses to endure an uncomfortable shock while running through the transmission zone, your pet can easily leave the enclosure area.